All men have had to wear a tie at some point in their life. For most guys, wearing a tie is uncomfortable and bothersome. You probably wonder why people even wear ties or where they came from. Neck ties originated in the early 1600s when members of the French military started wearing pieces of cloth around their necks called cravats, to identify themselves as a member of a certain group. Since then, neck ties have evolved and in the 1920s the current form of ties were developed. In the early 1900s, neck ties were worn by business men, to make them appear important. Ties soon became common in the workplace until the late 1960s, where the trend started to die off. Today, ties are more commonly worn for special occasions rather than daily business. However, I like to wear a tie to show my loyalty and allegiance, just as the early necktie wearers did in the 1600s. When ties originated, officers of the military wore the finest ties made of silk. Today, the same still holds true, with the highest quality of ties being made of silk. My A.K. Statesman line of ties are handmade from the finest quality five ply, 100% natural silk yarns. These purple and white ties come in several styles, give you a different tie to wear each day. Striped ties were made popular in Europe to identify yourself as a member of a group or organization. If you are a K-Statesman, what better way to identify yourself as a member than wearing one of my exclusive ties? 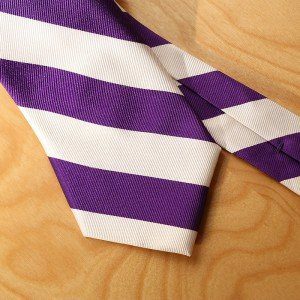 Shop the selection of ties on the website, as well as other apparel that distinguish you as a member of the Wildcat Family.